Scratchbuilt.com | Articles Index | What Doomed the Scratchbuilt Chassis? The article that follows is edited together from a series of conversations I had with vintage scratchbuilder and slot racer Steve Okeefe. My questions are in blue, and Steve's responses are in black. Enjoy! [Steve:] I am of the opinion that the scratchbuilt slot car chassis reached the zenith of its development the day before racer/builders started trying to eliminate the solid front axle. 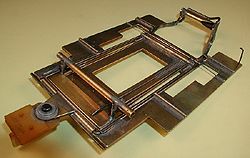 The scratch-built piano wire and brass plate anglewinder chassis with drop arm, plumber hinge, floppies, and solid front axle was a paradigm, an elegant and fully developed design, like the Pennsylvania Railroad's K4 Pacific steam locomotive, or North American Aviation's P-51 Mustang fighter airplane. Unfortunately, the relentless march of technology dooms all "fully developed" designs, as they have nowhere to go but be rendered obsolete by developments in other, sometimes unrelated, areas. The diesel motor with an attached electrical generator doomed the steam locomotive, the turbo-jet engine doomed the piston powered, propeller driven airplane. Know what doomed the scratch-built slot car chassis? I do, or at least, I can make a solid argument about it. [Steve:] All of this, before we go any further, is my opinion - highly arguable and near impossible to prove. I'm absolutely certain there are numerous other old slot racer/builders out there who have completely different opinions. In other words, I don't claim to own the truth, only to have gotten a glimpse of it and be able to put it into words. Anyway - I don't believe it was laser-cut chassis kits (they ARE kits by the way, requiring only assembly), and I wouldn't point to lower magnets and smaller tires. The tires and magnets were simply part of Sherman's march to the sea - an inevitable part of the relentless rush to increase performance - and scratchbuilders easily adapted to this. The laser-cut (or better, the EDM cut) chassis is closer to the mark, but in reality is one of the outcomes, rather than the reason. Here is a hint (in fact, two hints): Remember sometimes developments in seemingly unrelated areas result in the obsolescence of a paradigm, and Jim Hall seemed to understand the importance of these developments better than any of his peers - he just couldn't get it to work reliably. Eventually, however, others did. Oh, the Jim Hall hints are a give-a-way! Wing car bodies?? Aero effects? Do you take this theory the whole nine yards - That abandoning scale modeled automobiles did it? This does seem to me to be Bob Schleicher's view. Though he says this is what doomed all of 60s slot car racing, not just scratchbuilding. I know one group of people left at least partially over goop and glue. Lee Gilbert argued there was no other direction to go, that the paradigm was complete, and only small incremental changes were possible (today we use the expression, that his thinking was "stuck inside the box.") But Lee was right, that no more power could be transferred to the ground, the way things were. Making the axle rotate quicker and the tire sit flatter didn't make you go any faster. In my view, cheaper commercial stamped aluminum chassis caught up in performance to the scratchbuilts, who were stuck at this stage of small, incremental developments. Suddenly, the expensive, skills-heavy scratchbuilts didn't appeal to the younger generation, who could buy a cheap chassis and run 95% as fast. So it was uneconomical to scratchbuild - it cost money, and it took a skill that was a big-time investment to master. Scratchbuilding wasn't necessary to go fast. Plus, master scratchbuilders made their best designs available on the market - again, why bother to learn all that stuff and make dozens of chassis to refine your skills, when you could buy one, either from Champion or a specialized builder? Finally, in class racing where the younger generation now comes up, scratchbuilding wasn't even allowed, and so the scratchbuilding skills never transferred to the younger generation. That's kinda how I see it. In 1968/69 or so (at least, where I raced) cars weighed about 4 1/2 ounces, give or take about 1/2 ounce, and were as FLAT as you could possibly make them. Why? To provide just enough weight to improve traction and to lower the overall center of gravity. In this sense Lee Gilbert is absolutely right - if you made the car heavier, you slowed it down; if you made the car lighter, it would (and did) become undriveable. There was nowhere else to go, and no more power could be transferred to the ground. More than half the weight of the chassis (the whole car, actually) was hinged, suspended or otherwise indirectly attached (floppies, plumber and drop arm) to the drive mechanism (motor box and rear axle tube). Why? To transfer the downward force of the chassis weight to the wheels and guide, and yet remain isolated enough to absorb vibration and the inherent roughness of the track. This made the car drive more smoothly and predictably - very important - but at the cost of design complication and the absolute requirement for designing and building skills. In this sense YOU are absolutely right - these skills represented a big time investment to master (and, in the real world, not everybody has the talent, or the interest, to acquire those skills). The simple fact that there WAS a sufficient market for master builders and mass producers to sell their wares (copies) is a testament to the success of the design. If you wanted "go-fast" you HAD to have one of these! Then a big rock fell from the sky and all the dinosaurs died. The advent and perfection of aerodynamic downforce (aero effects - wing car bodies) provided all the things slot racers needed to go faster and couldn't get any other way. Suddenly, you didn't need the weight to get traction, and a slightly higher center of gravity didn't much matter. Lighter motors with strap cans and thin cobalt magnets, along with smaller tires, helped lower the C.G. anyway. Cars went from 4 1/2 ounces to 3, then 2 ounces (or less). Weight, hinged or otherwise, was not only unnecessary, it was unaffordable! Stability was provided by the aerodynamic downforce - you didn't NEED floppies, a drop arm, or even front wheels (and in the world of racing, if it is not needed, it is eliminated!) Chassis became simple one-piece affairs, cut out of a single piece of sheet spring steel (by scratchbuilders I might add). Unfortunately, it wasn't long before manufacturers began to employ stamping mills, laser cutters and wire EDM tools to crank out chassis at a rate (and price) scratch-builders couldn't touch. At that point, it was all over for the scratchbuilder. Not quite. Some of us still scratch build because we LIKE to. I do, and I like it so much that if I'm not allowed to enter the race because my scratchbuilt car doesn't conform to the (current) rules, then I'll just watch the race, thank you, and go home when it's over, drive my scratchbuilt car on my scratchbuilt track, and then scratch build some more. I have always believed you are not a "complete" racer unless you can build your own cars from scratch. Thanks , Steve! - If our Reader's would like to comment, or add to these points, please use the Scratchbuilt.com Message Board.